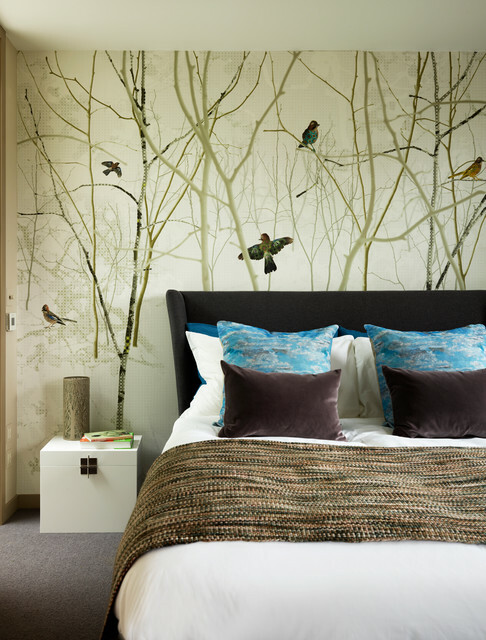 We designed this bedroom to give a powerful outside inside theme as it faces parkland out of the windows. This wallpaper has birds flying around the bed which are colour matched for the upholstery and cushions. Natural coloured carpet, sky patterned cushions and textured throw bring the scheme together beautifully. J'ai comme des envies de tout changer chez moi en voyant ce magnifique papier peint. Je joue au loto, on ne sait jamais. Ciaran’s room. With Black chests from Dunelm. Dark velvet headboard. White linen and dark throw. Rug?